There are few things as frustrating as being involved in a car accident, especially when it could have been easily avoided if the other driver had been paying attention to the road. Distracted driving is on the rise throughout the country due to the advent of smart phones, GPS systems, and smarter cars which require all-hands on to figure out how to work the computer system. It seems that as technology increases, the incidence of car accidents caused by technology correspondingly increases at the same rate. If you’ve been injured due to negligence like distracted driving, our Miami personal injury attorneys can help ensure you receive compensation for physical and emotional damage. Call Lipcon & Lipcon, P.A. to schedule your free consultation and continue reading below for more information. Distracted driving has long been a cause of car accidents since the advent of the motor vehicle. However, while distracted driving used to be caused by other passengers, eating in the car, or applying makeup, distracted driving is now more common than ever. It is routine now to see a person next to you on their smart phone while driving – a fact which leads to dangerous driving scenarios. Studies now indicate that distracted driving is often more dangerous than driving while under the influence. The reaction time it takes to look up to the road from your smart phone is often enough to cause devastating injuries to a pedestrian, bicyclist, motorcyclist, or other driver. Florida legislators recently tried to combat the rising number of accidents caused by distracted driving and cell phone use, by prohibiting texting while driving. While this has decreased the number of accidents slightly, distracted driving continues to be a large problem for all drivers on the roadways. Distracted driving accidents are often severe since they involve a driver who was unable to mitigate the severity of the accident. The failure of a driver to sense the impending accident can lead to a devastating aftermath. The failure to spot a bicyclist or pedestrian until the driver hits them will have a tragic impact on these victims. While other drivers on the road have more protection from distracted drivers, the results can be equally devastating. It is therefore important to ensure the distracted drivers are held accountable for their actions. A personal injury attorney can assist you in determining the full amount of damages you are entitled to receive as a result of your injuries. 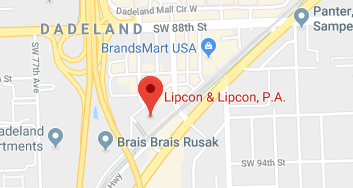 If you or a loved one have been injured in a car accident caused by distracted driving, do not hesitate to contact the attorneys of Lipcon & Lipcon. Our attorneys have over 60 years of combined experience in handling personal injury claims related to victims of distracted driving accidents. It is important that the negligent driver is held accountable for their actions in causing an accident – otherwise, they will continue to pursue this type of behavior, leading to more accidents in the future. Contact our Miami accident lawyers today for your initial free consultation.